Natural Swimming Pools combine the best of swimming pools and beautifully landscaped ponds to promote a sense of well being and relaxation. A dual filtration and pumping system along with the natural filters from aquatic and marginal plants rooted within gravel and shingle banks (known as regeneration zone) create a pure water swimming experience unrivalled by its chemically loaded counterparts. The pond is divided into two separate compartments (swimming and regeneration) by a dividing wall which lies discreetly under the surface allowing the water to be gently circulated between the two areas. Wetland plants within the regeneration zone are known for their ability for filtering and absorbing nutrients which leaves nothing behind for algae or bacteria. Beneficial wildlife inhabits this area controlling unwanted pests such as mosquitoes. Swimming in pure natural water boosts circulation and the immune system. It has an anti inflammatory effect and is likened to swimming in mountain streams leaving you with a wonderful sense of well being. One has to question whether regular swimming in a chemically cleaned, chlorinated pool is a healthy pursuit. With the skin being the largest organ of the body and capable of high levels of absorption, the risk to long term health from immersion in potentially carcinogenic chemicals is not something everyone is happy with! Swimming in a natural pool on the other hand gives you all the fitness benefits with none of the risks. 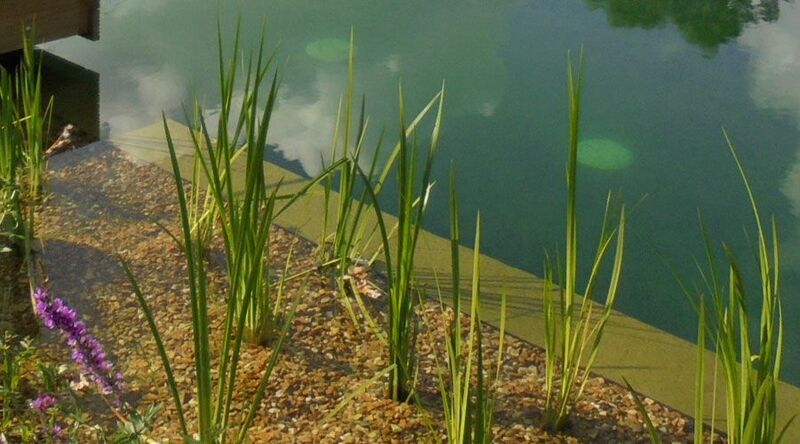 We will blend your natural swimming pond with its surroundings, and whilst you feel you are swimming amongst the beautiful planting, the dividing wall just below the surface means the plants and wildlife are left undisturbed by the swimming zone. Plants are carefully selected using native species to create colour and contrast from month to month. 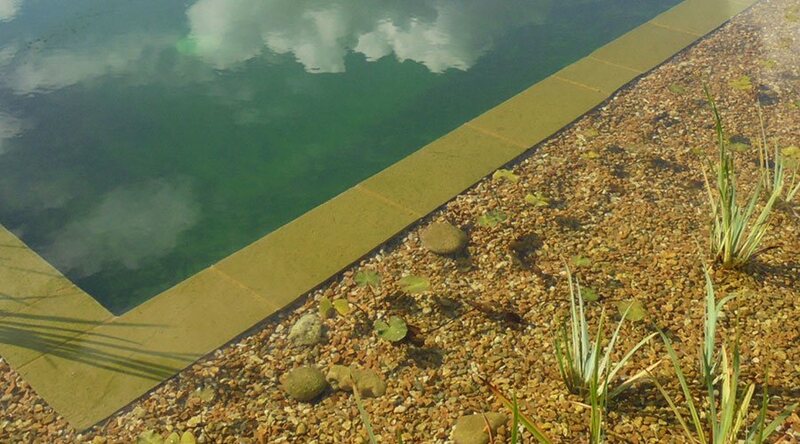 The aquatic and marginal plants are of key importance in creating the correct balance for the size and location of the pool, and are vital to the overall filtration of the water. Additional pumps and filters will be installed to work in conjunction with the natural purification process, ensuring the water quality remains crystal clear. 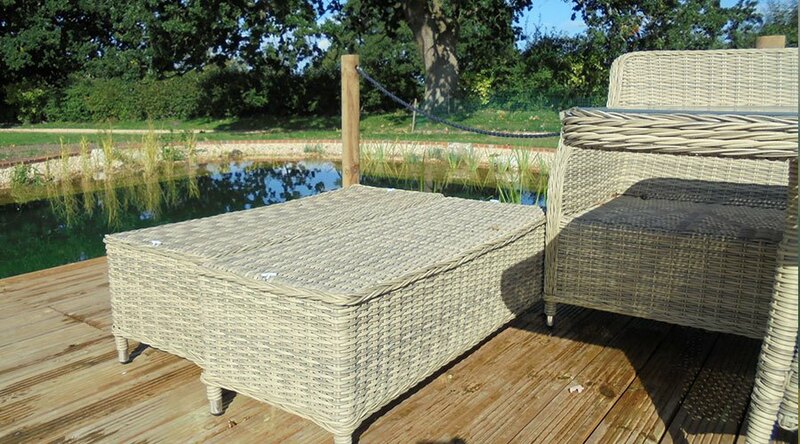 Seating areas are designed to bring the whole family together to swim, or to just enjoy the wildlife around you. Our aim is to promote our natural swimming ponds using a tailored design service to allow the construction of a bespoke swimming pond to suit all of your requirements and budget. Matthew Stewart has over 30 years of Landscaping experience and offers a complete design and build service for your natural swimming pool.